Sometimes you’ve got to strip it all away and get down to the bare necessities. After six months of recipe testing, I was able to digest and implement this practice. Understanding that good food does not need to be complicated. The time and practice were well worth the experience. Along with a ghee-licious recipe for moong daal, I love. You would think a girl who grew up eating daal every other week, could just whip up a batch of soupy moong daal. It would be easy breezy. Well…apparently, that wasn’t my case. Growing up moong daal was served like a dry curry. In which the integrity of the lentil remained. We ate this tomato based dish with chapati. Sometimes rolled into a burrito. It was our road food. We also made other single soupy-style lentil recipes like tuwar and urad, but never moong. Hmmm—maybe it was a regional thing? I am not really sure of the why, but I do know there are a plethora daal recipes in South Asia. They vary from town to town, street to street, home to home, religion to religion—that’s just the glory of daal. While working on this recipe, I pulled out every typical ingredient from my daal bag—fried onions, whole garam masalas, an array of spice mixes, but none of them were giving me that simple, uncomplicated goodness I was seeking. After a couple months and an overload of moong daal, I realized I needed a break. I was trying too hard and the repeated disappointment was fostering stagnated ideas. My creative juices were running dry. Eventually, good ol’ Father Time delivered a message. “Just make it the simplest way you know how”. And boom. That’s my story of how a girl whose life was turned upside down, over a simple moong daal recipe, developed Ghee-licious Moong Daal. I am loving this recipe. It has been on my weekly rotation for a few weeks now. It’s nothing fancy or complicated, it just simple, traditional, goodness. The combination of ghee and hing (asafetida), add a buttery touch, while still keeping the daal light. It’s not overly spicy or predominant in one spice versus another. I am grateful for this lesson and hope that each time I make this recipe, I am reminded of the value of simplicity. 1. Rinse and soak moong daal for a minimum of 20 minutes to overnight if possible. This aids with digestion, slight starts to sprout the pulse and can reduce cook time. I soaked mine for about 4 hours (after I had breakfast). 2.In a 4 quart pot add water and rinsed mung daal (throw out the water it was soaked in). Bring the daal to a boil on medium-high heat with the lid slightly uncovered. Remove foam, if any. Cover and let the daal simmer on medium heat. Be careful it doesn’t overflow. If this happens lower heat and/or leave it slightly uncovered. 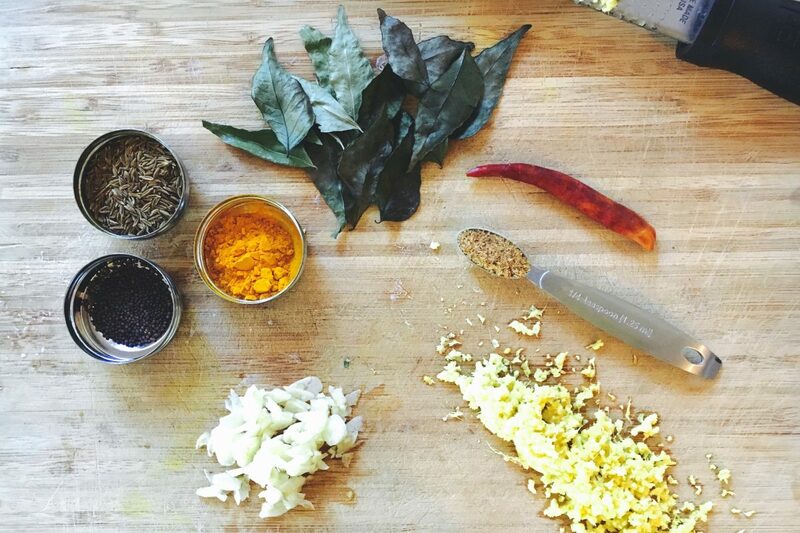 While the daal is cooking, prep your spices and bring them close to the stove. The oil infusion is a fast process, so having all your spices measured out and nearby is really helpful. 4. Immediately, but gently, pour the infused ghee into the simmering daal. It will sizzle and you will see lots of steam. 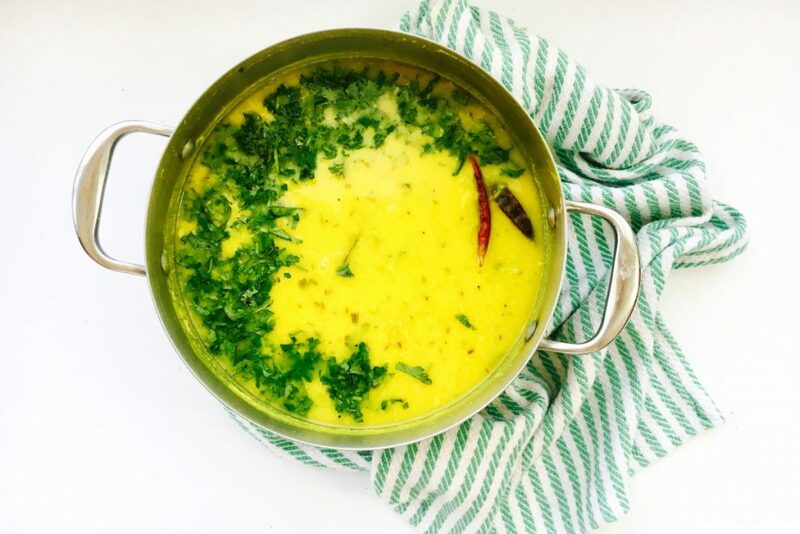 Get every last drop of the infused ghee into the daal. I also like to ‘rinse’ the pot, by adding a little bit of the daal into the infusion pot. Give the daal a good stir. Continue to simmer with the pot slightly uncovered until the lentils are well blended & creamy. 5. Once the lentils have dissolved add the salt. Continue to cook until the lentils and the water are melded together. If daal is too thick, add a little warm water. If it’s too thin, continue to cook with no lid until you get the consistency you like. 6. After the daal is nicely blended and creamy. Turn off the stove. Add the cilantro and lemon juice and cover for 3-5 minutes before serving. Notes: The total time ranges from 30-40 minutes. If you live in high altitude, times may differ—consider using a pressure cooker to cook the lentils first. If you prefer a really smooth daal, once the lentils are cooked and the foam has been removed, blend the daal with a hand blender. Then continue with step 3. This recipe is for a daal on the thinner daal, like the consistency of a soup. If you prefer a thicker daal, reduce water (you can always add more water—always add warm to hot water to keep the temperature same and to avoid longer cooking time ). Moong is the favored lentil in Ayurveda. It is known for its digestibility, overall nourishment, and sattvic nature. It is also the key ingredient in khichadi, a simple rice dish enjoyed throughout South Asia. When feeling under the weather, daal is like chicken soup for the soul. I like to have moong daal over a little basmati rice, as a compliment to a veggie dish or use it as a soup stock. In the autumn, I add an extra dollop of ghee, or if you have a pitta/vata dominant dosha that dollop can come with each season.